Happy New Year everyone! We can’t believe that another year has passed us by and here we are, welcoming in 2013, where has the time gone?! We hope you all had a fabulous Festive season and for those of you who had a Wintery wedding, we hope you done so in style! Now the turkey is all gone, the mince pies all eaten and the Christmas tree is down, it is time for us here at HQ to look forward to all things ‘wedding’ for the new year – Don’t tell anyone, but it’s our favourite time of year! It’s time for us to get working on some fab new designs and ideas to really make your weddings in 2013 look beautiful whilst still being excellent value for money. This bouquet is delicately coloured with pink orchids, ivory open Isabel roses, pink cherry blossom and lilac cottage roses. 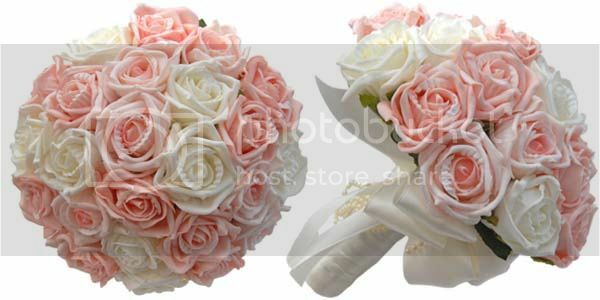 This bouquet is versatile enough for all kinds of theme weddings and would work perfectly for a more vintage themed wedding. Priced at £57.50 this large, captivating bouquet is real value for money. This Bridesmaids bouquet has to be one of our favourite new additions: With sumptuous silk peonies and delicate pink orchids, both the colours of these flowers work well with the soft green or the peony leaves. It’s hard to believe that this bouquet is for a Bridesmaid but remember we can match this style and make it into a custom order, just for you. Buttonholes for the guests are often overlooked as sometimes they can be pricy to get a flower to match in with the rest of the wedding. 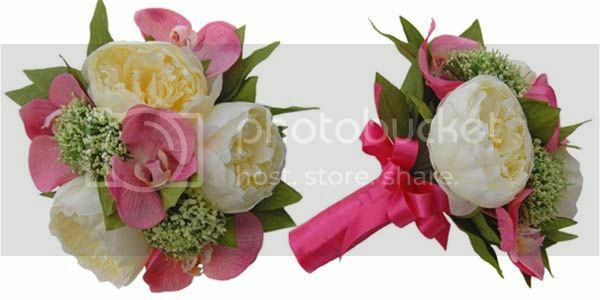 Along the same theme, these cute buttonholes not only look soft, but are also from our soft-touch range. 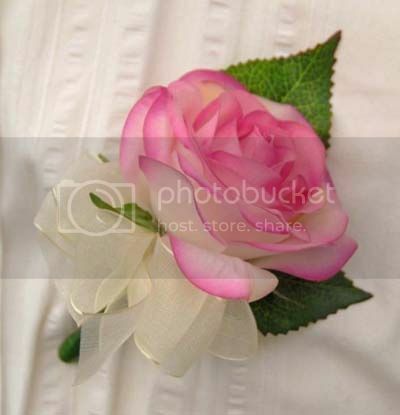 True to a real rose, these buttonholes want to be touched, with a delicate openness to the rose, these will really make all your guests feel truly part of the wedding. This is just a mere snippet of what is new and up and coming in the year 2013 for Sarah’s Flowers, Call it our New Year resolution to you, this year we will continue to work hard to fulfil your expectations, providing you a superb level of service (the type you should expect on your wedding day) and value for money. Over the next couple of weeks we will be looking at the big trends of 2013 for dresses, colour choices and even themes and if that wasn’t enough for you, we are getting to the nitty gritty and giving you some top tips of ways to save for your big day. Until then, let us hear your New Year Resolutions! 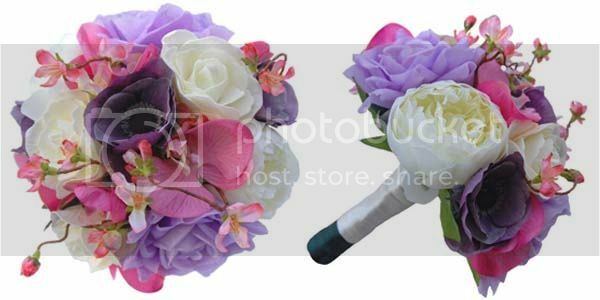 This entry was posted in Brides, Bridesmaids, General Interest, Wedding Themes and tagged 2013, artificial wedding flowers, Bouquet, Bride, Brides bouquet, Bridesmaids, bridesmaids posies, Bridesmaids Posy, fairytale, feminine pinks, hot new trends, lastest wedding flower trends, liliacs, new 2013 wedding colours, New Year, New Year Resolution, new year themes, prettiness, pretty flowers, resolutions, sarahs flowers, sarahsflowers, silk flowers, wedding, Wedding bouquet, Wedding bouquets, Wedding Buttonholes, wedding day flowers, Wedding flowers, Wedding for the new year.